Joe Campolo is a lawyer, writer, speaker, philanthropist, and veteran who believes that approaching life with passion is the only way to make a lasting impact. Recognized as a “Long Island Icon” and Long Island’s leading authority on negotiation, Joe serves as the Managing Partner of Campolo, Middleton & McCormick, LLP, a premier law firm with offices in Westbury, Ronkonkoma, and Bridgehampton, New York. He is also a co-founder and the Board Chairman of Protegrity Advisors, a leading M&A advisory firm. Joe has spearheaded some of the most important initiatives in recent years to grow the Long Island economy. As President of the Stony Brook Alumni Association, Joe helped launch many new university initiatives including the Distinguished Alumni Awards Dinner and transforming its Homecoming celebration. As Chairman of the Hauppauge Industrial Association (HIA-LI) Board of Directors, he is the driving force behind projects that attract public and private dollars to support economic development on Long Island, including the Hauppauge Industrial Park, and has facilitated partnerships among the region’s power players to boost the economy and promote innovation. Joe is also a philanthropist who gives financial support and time to some of Long Island’s most impactful nonprofits. He serves on many prestigious nonprofit boards including the Staller Center for the Arts at Stony Brook University, the Energeia Partnership, and the Tesla Science Center. Previously, he served on the boards of Make-A-Wish, the Tourette Association of America, American Red Cross on Long Island, UCP of Long Island, the Long Island High Technology Incubator (LIHTI) and Child Abuse Prevention Services (CAPS). Joe served as President of CAPS, where his groundbreaking work helped to create and fund SurfSafe to keep children safe online. His work on child safety and the Internet has been used by many parent groups and other organizations, as well as cited by Congress and federal courts as legal support. Joe proudly served honorably in the United States Marine Corps as a non-commissioned officer with the First Marine Division, Fifth Marine Regiment (“Make Peace or Die”). He is a member of St. George’s Golf & Country Club in Stony Brook and is an Executive Producer of Tribute, an award-winning short film. 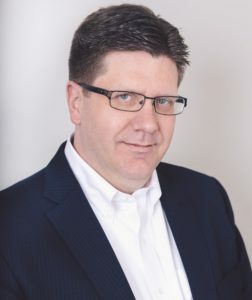 Joe is a published author on negotiation and business development and pens a popular blog, Off the Record, where he connects with the business community by sharing his refreshingly honest views on current events, important social issues, and deeply personal topics. He has also built a reputation as a skilled interviewer of fellow thought leaders, taking an investigative and solution-based approach to the critical issues that affect Long Island business. Joe lives in Stony Brook, New York with his wife, Alyson, his daughter, Katharine, and their cat, Molly.